On February 25th, the SODO BIA, along several other of Seattle’s neighborhood business districts delivered a report to city officials regarding persistent crime in our neighborhoods. 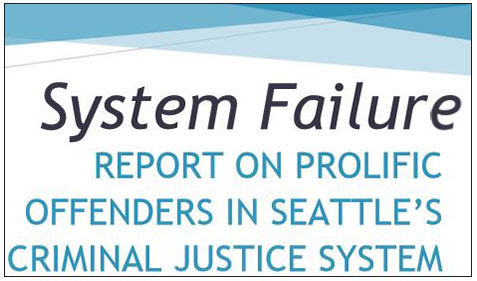 The report, titled, “System Failure – Report on Prolific Offenders in Seattle’s Criminal Justice System” was commissioned by neighborhood business districts in SODO, Pioneer Square, Chinatown/International District, Downtown, Ballard, the University District and Seattle’s tourism industry. It analyzes a sample of 100 individuals with high frequency levels of criminal activity (minimum four King County Jail bookings within the past year), community impact, root causes of problem behaviors, and why Seattle’s criminal justice system fails to reduce their recidivism. Report data was compiled from publicly available databases. It is not too late to reach out to city leaders for assistance, please send your comments via email to city officials. Click HERE for a sample on what to include.